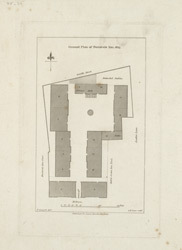 This is a plan of Furnival's Inn in Holborn. Adjacent to the Inn is the Bell and Crown Inn yard. Furnival's Inn was one of the Inns of Chancery, which by the 15th century had become preparatory schools for students wishing to be called to the bar by the Inns of Court. By 1530 Furnival's Inn was affiliated to Lincoln's Inn. By the 18th century the Inns of Chancery had become social clubs for solicitors and had ceased to have any educational function.